INCUBEATOR is dedicated to Jengyee Liang. The inspiration for the idea of incubeator began in 1994 and emerged more fully in 2004 after I met Jengyee Liang. We met as part of a college Students and Almuni Mentorship Program. Jengyee and I not only shared similar perspectives about the value of peer-to-peer learning but also the importance of the environment and of developing and serving people and communities. One of the many discussions we had throughout our mentor-mentoree relatiopnship was about internships. After Jengyee had several summer student internships, she expressed frustration and concerns about internships because of some prior bad experiences. In December 2004, I encouraged her to journal – write her thoughts down … good, bad, happy, sad, indifferent, doodle … whatever automatically flowed from her writing. Meanwhile, I (as a business owner/consultant at the time) also would write down my thoughts about how I would make any internship experience I offered at least somewhat fulfilling, as Jengyee would hope to have for any students’ experiences. Jengyee’s result? She wrote a book called Hello Real World! : A Student’s Approach to Great Internships, Co-ops and Entry Level Positions. While she was writing her book throughout 2005, she encouraged me to start a blog to chronicle the experience of one of my interns; the blog, affectionately called REALITY| Intern became a reality in early 2006. Incubeator is being created in honor of her third goal. 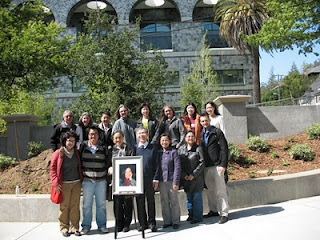 In February of 2009, family and friends held a memorial at the Cal Berkeley campus, and a couple of months later on April 27, a memorial tree planting and dedication was held outside on the northside of Cal Berkeley’s CITRIS building. Wow! What a journey!! Thanks for being the impetus behind this book. No telling when I would have sat down to document my experiences without your initial suggestion and continued support. May this book bring you many amazing internship moments. Now I am glad to be sitting down to share my thoughts about incubeator.